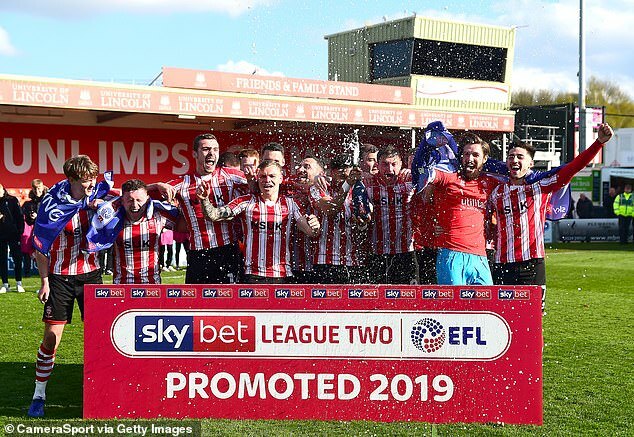 Lincoln City made it two promotions in three years on Saturday as they drew 1-1 against Cheltenham to seal their place in League One next season. Most of the supporters at Sincil Bank had left when it was announced that MK Dons had lost 2-1 away at Tranmere. 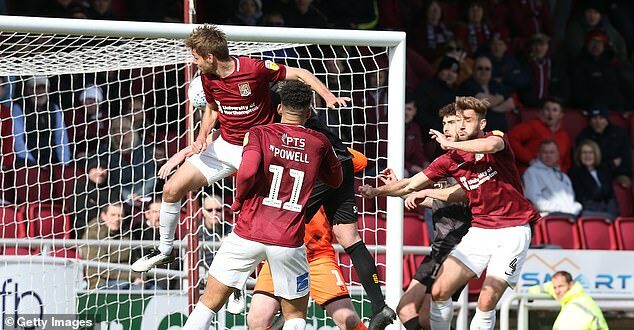 With MK Dons and Mansfield – both 12 and 11 points behind Lincoln with four games remaining – still left to play each other on the last day of the season, it means that both of them can’t overtake Lincoln. Lincoln took the lead through Shay McCartan in the first half but were pegged back when Cheltenham’s George Lloyd scored with 17 minutes to go. ‘We’re obviously delighted to have won promotion,’ said manager Danny Cowley. ‘I’ve been sick and tired of having that conversation all week with people, (having to say) “We haven’t done it yet we’ve still got a bit to do”. ‘For us to beat the club record of 19 games unbeaten, for us to get promoted to League One, it’s been a project all season we’ve been working towards but ultimately it’s been a lifetime’s work. Cowley addressed his players after the game and praised them for their ‘effort’ and ‘sacrifice’, but stressed how important it would be to clinch the title on Friday if they win away at Carlisle. 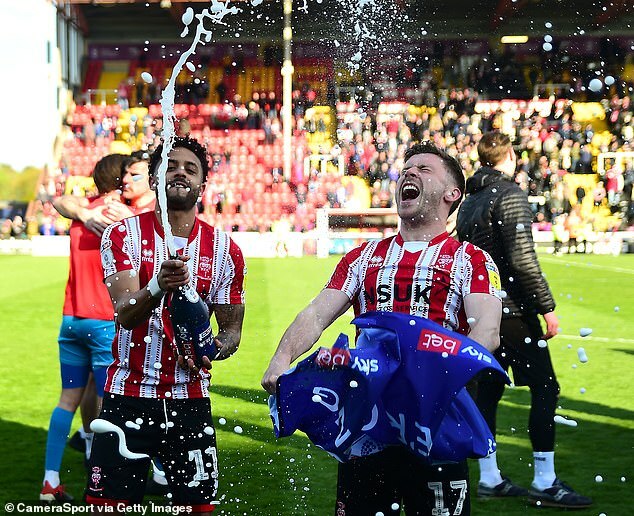 The point proved enough for Lincoln to become the first team in the Football League to seal promotion after third-placed Mansfield drew and MK Dons lost to play-off rivals Tranmere. A second-half headed brace from Dominic Telford, strike partner Nicky Maynard providing the assist each time, handed Bury a 2-0 victory over Colchester as the Shakers moved into second. Promotion hopefuls Mansfield were held to a 1-1 draw at Northampton after Malvind Benning’s opener was cancelled out by Sam Foley’s header for the hosts. MK Dons dropped down a spot to fourth following a narrow 2-1 defeat at Prenton Park. Kieran Agard’s header just after the half-hour mark, his 20th league goal this campaign, cancelled out Tranmere midfielder David Perkins’ opener. But the hosts hit back as Connor Jennings headed home after 62 minutes to seal maximum points. Sixth-placed Forest Green strengthened their play-off push thanks to a 2-0 win over Macclesfield, with Christian Doidge and Joseph Mills on target in the second half. Exeter got their play-off hopes back on track with a comfortable 2-0 win over Port Vale at St James Park. Kurtis Guthrie dealt Carlisle’s play-off hopes a blow as he netted a brace in a 3-0 defeat at Stevenage. Guthrie scored twice, his second from the penalty spot, after setting up Arthur Iontton for their opener as the hosts moved up a place to 11th. Sam Edmundson put Latics ahead as he slotted home the rebound following Mohamed Maouche’s free-kick after seven minutes, but Michael Doughty levelled from the penalty spot on the stroke of half-time. Kyle Bennett put the away side in front just after the hour mark before Oldham levelled with 20 minutes remaining through Johan Branger to seal a point. Cambridge slipped closer to the relegation zone after a 3-0 defeat at home to Newport, with Padraig Amond, Jamille Matt and Harry McKirdy on target. Morecambe and Grimsby claimed a much-needed point each from a 1-1 draw as Aaron Collins’ second-half penalty was cancelled out by a late effort from Grimsby’s Charles Vernam. Basement boys Notts County sunk further into trouble as goals from Aaron Taylor-Sinclair, Ryan Wintle and James Jones secured Crewe a 3-0 win at Gresty Road, while Filipe Morais’ second-half effort proved enough as Crawley edged past second-bottom Yeovil 1-0. Next articleCe champignon mortel se propage dans le monde d’une façon préoccupante !